Experts comment on the jailed tycoon’s early release. 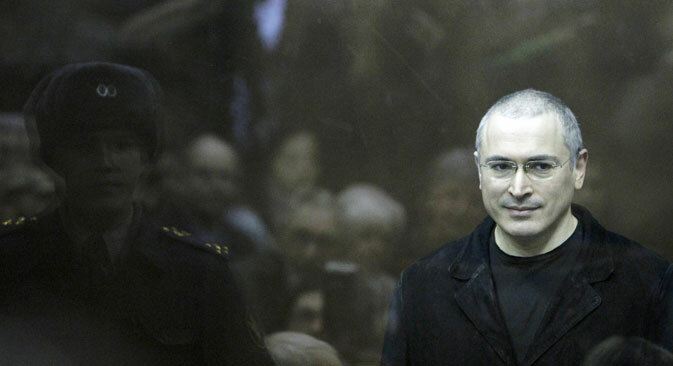 Russian President Vladimir Putin has signed a decree pardoning the former head of Yukos, Mikhail Khodorkovsky. The decree entered into force immediately on Dec. 20. Analysts agree that Khodorkovsky's early release is very good news for Russia and opinion polls indicate that the general public also approve of the decision. It turns out that the release of Russia's most famous prisoner is seen as an important development not only by human rights activists and experts, but ordinary Russians as well, although polls show that some 15-20 percent of those surveyed still say that they "know nothing" about the Khodorkovsky affair or the man himself. Former Yukos head Mikhail Khodorkovsky has flown to Germany, where his mother is undergoing medical treatment, the Russian Federal Corrections Service said. According to the Public Opinion Foundation (FOM), at the time of Khodorkovsky’s arrest in October 2003, 29 percent did not know who he was, 28 percent did not give an answer, and only a small minority expressed any sympathy for Khodorkovsky’s position. Lev Gudkov, head of the analytical Levada Center said that over the past decade, the case of the convicted tycoon has been of interest “to educated people who get their information from independent sources, and are therefore aware of the political context." He says that these people make up only 25-30 percent of the Russian population and the vast majority of them have always believed "Khodorkovsky should be a free man." The rest of the Russian public know very little about the case that sent him to prison, and find it difficult to return any meaningful answers during opinion polls. Nevertheless, when asked to name the country's most famous political prisoners, Russians usually mention Khodorkovsky more often than any other figure (37 percent). On the other hand, only 45 percent of those polled agree that there are political prisoners in Russia. Twenty-eight percent of respondents say that there are no political prisoners in the country and another 27 percent is not sure. In the opinion of Valery Fedorov, head of the Russian Public Opinion Research Center, regardless of how the Yukos affair is seen in Russia, the president's decision to pardon the tycoon will be considered positively overall. Experts also agree that the president made his decision in order to improve Russia’s international reputation. "The very fact that Khodorkovsky has asked to be pardoned means that he has admitted his guilt. This puts an end to claims that the case was politically motivated. He has appealed to the president, who is the guarantor of citizens’ rights, and asked for clemency. Some people have been trying to foist on us this idea that the case was politically motivated, but this is not so." "I think that there will be a huge number of people who will try to persuade or force Khodorkovsky to return to politics, use him as the figurehead of a political party, and use his name, just as they have always done. The only difference is that previously, he was portrayed as a political prisoner, whereas now he will be portrayed as someone who has suffered for speaking the truth." "I believe, however, that there must be some kind of unofficial agreement between him and Putin, so he will not become involved in politics any time soon. Even if he does, he poses no threat to Putin as a political rival. Khodorkovsky has never been a people’s hero, a figurehead of large protests, or even a popular politician. His significance and role in Russia have been greatly exaggerated by liberal rights activists. But he has become an icon in the West, and that has turned into a problem for Russia. Now, however, the West will have to welcome this decision by Putin, albeit through gritted teeth." "This is the biggest news of the decade. I think this is the result of [Khodorkovsky] being threatened with a third jail term. He has already served two, and then persistent rumors started to circulate that there will be a third. Of course, that would have been hard after 10 years in jail." "I think that had Khodorkovsky appealed for clemency after serving the first five years, Putin would have pardoned him. Putin is an archaic man; it is important to him that Khodorkovsky ask him first, and admit his guilt... And now, as you can see, the stock markets have reacted positively. If Khodorkovsky really did sign the appeal for clemency himself, this is a good way out of the situation for Mr. Putin. It is a good way out for Khodorkovsky, too. How long can a man remain a liberal poster child in such difficult circumstances? Navalny is rising, Prokhorov is rising - but what does Khodorkovsky gain? Still, I think he is a tired man, and he is not stupid; he is not going to rush into politics." Aleksandr Malis, head of the Euroset company: “This creates an impression in the business community that the government is easing pressure on entrepreneurs, and that it is becoming less dangerous to do business in Russia”. This story was combined from reporting by the Kommersant, Moskovskiy Komsomolets and Gazeta.ru newspapers.